In Serial Experiments Lain, there's a character named Eiri Masami who hacks the internet to give himself godlike powers within it, then gains consciousness online as his body dies in the real world. If that's starting to sound familiar, there's one catch: Eiri Masami is the villain of that series. Let's just say it's a good thing Shibumi has altruistic intentions. If ever there was a scene that prepared all the little kids for watching Lain, Shibumi's discussion with Takato and Henry was it. Mind you that's not an entirely good thing: Lain is a slow, deliberate series and that kind of pace brings this episode to a standstill. Nothing of interest happens and the conversation is less plot dump than philosophy discussion: for all the answers to stuff like the blue cards and the digi-gnomes, the bulk deals in hypotheticals. Nothing, not even the existence of the tamers themselves, avoids scrutiny here. This is the first time the show asks the question of why the Digital World looks the way it does. In every series, the world is primarily wilderness. There are a few stray buildings and civilizations here and there, and even some token cities, but for the most part it is a vast frontier. This shouldn't make sense. If anything, a world based on the digital output of humanity should be a crowded, busy urban landscape, ever-growing as our output increases. Shibumi offers us some clues as to why the world looks the way it is- it's all perception. The Digital World isn't a sprawling city because we don't view the internet that way. To us, especially at the time the first few seasons of Digimon aired, the internet was open and lawless and waiting for us to claim our stake or reap its riches. Even today, we view it as large and boundless. That collective mentality may have helped shape the Digital World. And that ideal of computers and the web furthering us makes it easy to understand Shibumi's thoughts on Digimon progressing on their own and the digi-gnomes evolving from the world to grant wishes. Perception defying reality has been a big part of the Digital World experience so far. Having been converted into data, the rules that normally govern human physiology don't apply. The kids are only hungry when they perceive that they should be. They only need to breathe under water when they perceive that they must. Henry is able to exploit that, and it helps explain why these kids never have to use the bathroom. Shibumi also sheds some light on the D-Powers, originally called D-Arcs in Japan (chalk that up as an “oh crap, that was important?” moment for the dub). Alluding to Noah's Ark when it comes to “bringing kindred pairs together” in the context of these handheld devices is a bit clumsy, but suits the analogy fine (and will have a nice payoff later). The really interesting part is the suggestion that we shouldn't imply that Guilmon and Terriermon were made for their partners, and that the opposite may be true. Yes, they went there- inviting the notion that Guilmon created Takato instead of vice versa. It's pretty heavy stuff, and they don't do much with that hypothesis (for more of that, you're stuck reading my fanfic), but the point of emphasis is that the connection of a tamer and his or her partner is so deep that one cannot fully exist without the other. Silent moment of appreciation for the gathering of everybody's parents to collectively freak out over everything. Bonus for Janyuu giving us a valid explanation for why kids are always picked for this sort of thing. It's a world of pure imagination, you know. Silent moment of awe that Takato had the stones to pretend to be all the other kids to let their parents know they're all right... even though for all Takato knew, Orochimon ate all of them (or they all went on life-altering milkshake benders). Nice to see Henry with a goddamn action hero moment! After Rika and Janyuu had theirs, you knew he had one in him. 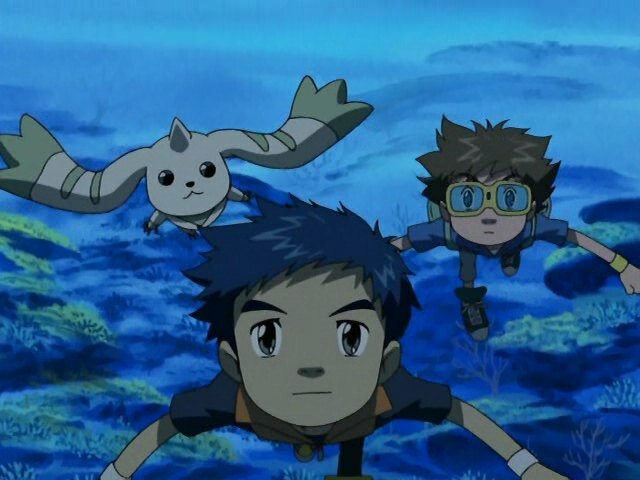 Takato's top priority is finding Guilmon (and maybe Jeri and them). Henry's top priority is getting the hell out of this world. Henry, I'd like to introduce you to a friend named Taiki (or maybe it's Mikey now) who has something to say about turning your back on people. 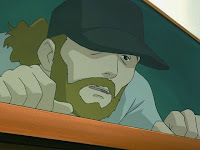 Takato shoehorns a Zero Two reference into the dub when he recognizes Azulongmon as one of the Sovereign (as he's actually a Lain character, Shibumi's allowed to call them gods). Not only is it a fantastic frame of reference, it perfectly illustrates Henry's point about not rushing to judgment and assuming the Sovereign are bad guys. When Shibumi goes back to sleep, he utters, “To sleep, perchance to dream” from Hamlet. As if this episode wasn't existential enough.
" 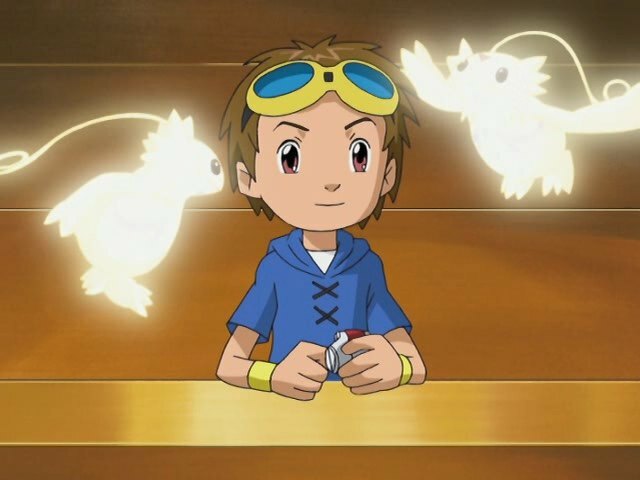 Yes, they went there- inviting the notion that Guilmon created Takato instead of vice versa. It's pretty heavy stuff, and they don't do much with that hypothesis"
Which is just as well, as it's totally nonsense that, in any case, contradicts what we saw in the first few episodes. You're not thinking with enough metaphysics! Why does what we saw have to have been real? Regardless, a fantastic episode.